Thu., Aug. 23, 2018, 12:24 p.m.
ROME – A delegation from Italy’s rights office on Thursday visited the 150 migrants who have been kept onboard a coast guard vessel for days and concluded they were being held unjustly. The comments challenge Italy’s anti-migrant interior minister, who has declared that no migrants whom he considers “illegal” will set foot in a Sicilian port. Daniela de Robert, the rights delegation chief, spoke after a three-hour visit aboard the Italian coast guard vessel Diciotti, which is docked in Catania on the Mediterranean island of Sicily. She told Sky TG24 TV that the migrants on the boat come from countries that could make them eligible for international protection. She said nearly 90 percent are from Eritrea, while the others are from Syria, Sudan and Somalia. “We found what we thought we’d find: persons deprived of freedom without any measure from judicial authorities,” the Italian news agency ANSA quoted her as saying. The Diciotti rescued the migrants on Aug. 16 after they set sail from Libya in an unseaworthy boat launched by human traffickers. Shortly after the rescue at sea, 13 people with health problems, including children, were evacuated to a hospital. On Wednesday night, 27 unaccompanied minors, all teenagers, were allowed to disembark in Catania following an appeal by a juvenile court judge. A psychologist who met with the minors said many were males from Eritrea who had been detained for long periods in Libya. “One boy couldn’t see well, he constantly was trying to focus when his eyes were hit by light,” said Nathalie Leiba, a psychologist with Doctors without Borders. The boy explained that he had been kept for a year in darkness. 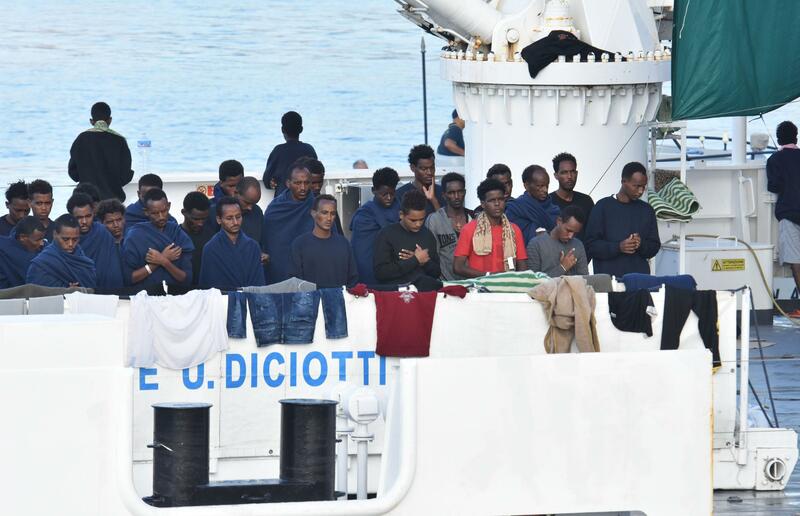 Interior Minister Matteo Salvini on Thursday described those aboard as “illegal immigrants,” and said they won’t be allowed to step foot on Italian soil. Instead, he insisted fellow European Union nations take in some of the asylum-seekers. Salvini didn’t immediately respond to the rights delegation’s findings. The rights workers donned masks and gloves to guard against disease for their visit. Most of the migrants aboard have scabies, authorities said. Salvini leads the League party, a coalition partner in Italy’s new populist government, and has promised to relentlessly crack down on illegal immigration. He has expressed irritation that EU nation Malta didn’t rescue the migrants when their boat passed through the Maltese search-and-rescue area. Malta retorted the boat wasn’t in distress and that it wanted to keep sailing to Italy. Some 600,000 migrants in recent years who were rescued from smugglers’ boats have landed in southern Italian ports. This year migrant arrivals via the central Mediterranean Sea route to Italy have dropped dramatically and many have shifted over to landing in Spain. Nonetheless, Salvini is still pressing a crackdown on migrants. Some officials in the government’s main party, the 5-Star Movement, have distanced themselves from Salvini for that reason. Paola Nugnes, a 5-Star senator, told the Corriere della Sera newspaper that “the priority is to safeguard universal rights. Then, but only then, do you turn to Europe to discuss” the solution. She said the coalition alliance with the right-wing League party has been “complicated” from the start. Published: Aug. 23, 2018, 12:24 p.m.